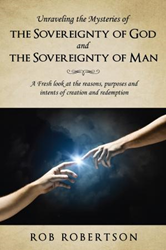 Rob Robertson’s new book, Unraveling the Mysteries of The Sovereignty of God and the Sovereignty of Man, ($14.99, paperback, 9781498455121; $7.99, e-book, 9781498455138) has a thought-provoking mission: Understand God and understand You – the end result will be a much better YOU. As an Associate and Youth Pastor, teaching, preaching and working in other functions of church life, the author realized he had substituted “working for God” as his spirituality instead having a real, vital and enduring relationship with God. This book is the result of the journey that has become his “living in the world but not of it.” This work is for the purpose of returning the body of the Christ to its original roots and living in this ever-changing world as overcomers, not those being overcome. This book extinguishes misconceptions, wrong ideas, opinions and lies about God and You. Xulon Press, a division of Salem Media Group, is the world’s largest Christian self-publisher, with more than 15,000 titles published to date. Retailers may order Unraveling the Mysteries of The Sovereignty of God and the Sovereignty of Man through Ingram Book Company and/or Spring Arbor Book Distributors. The book is available online through xulonpress.com/bookstore, amazon.com, and barnesandnoble.com.